Throughout time, cultures around the world have honored special traditions as part of their wedding celebrations. During the 15th century, people took their yearly baths in May and would generally get married in June. 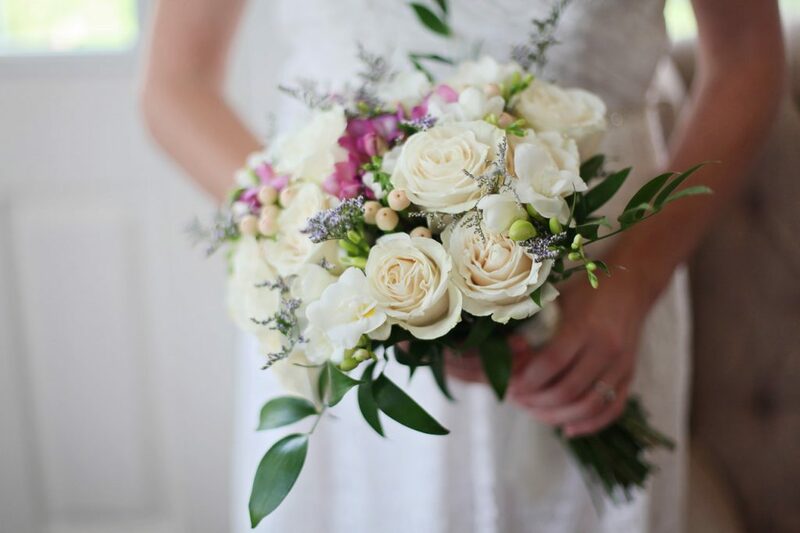 Just to be safe, brides carried bouquets to mask the smell of body odor. Throughout the world, weddings are sacred ceremonies with tremendous impact on the future lives of the couple. 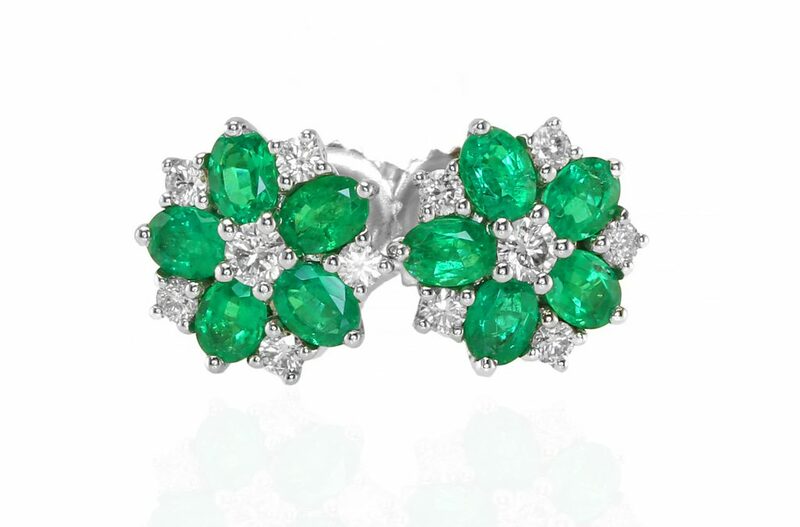 For this reason, they are associated with many customs and superstitions. The Victorians believed it was lucky to marry on the day of the week the groom was born, but the luckiest day to marry was the groom’s actual birthday. If you take a photograph of the one you love and hold a ring on the end of a thread in front of it, you can determine if they will be your future mate. If the ring moves in a circle, you will marry the person in the photo; if the ring moves back and forth, it is unlikely you will marry them. Should the ring not move at all, you are likely to remain single. The bride and groom should smash their glasses after the toast to ensure that they are never used for a better purpose. If a small piece of wedding cake is passed three times through a wedding ring and then placed under her pillow, a woman will dream of her future husband. The same effect is achieved if a borrowed wedding ring is placed on the third finger of a woman’s left hand and her shoes are placed in the shape of a “T” before she goes to sleep. If a woman eats a salted herring just before she goes to bed, her future husband will appear to her in a dream, bearing a cup of water to quench her thirst. 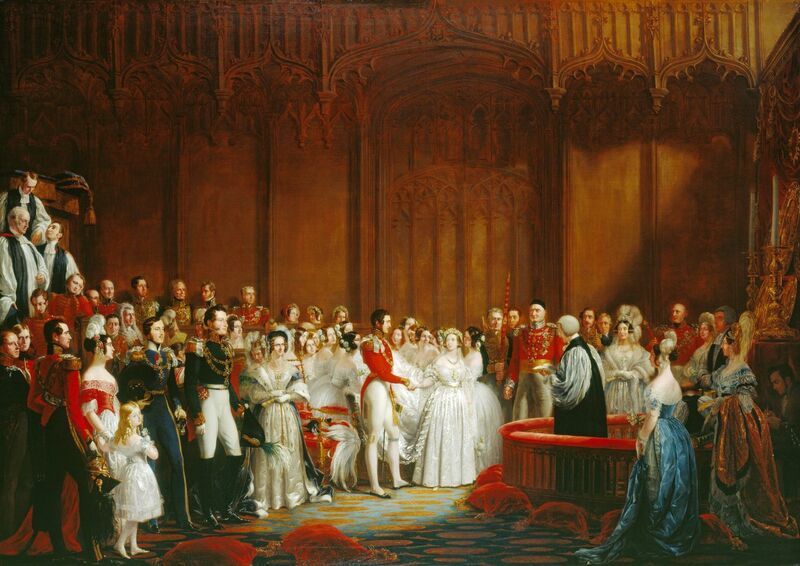 A portrait of Queen Victoria on her wedding day to Prince Albert. She popularized the color white for wedding gowns. 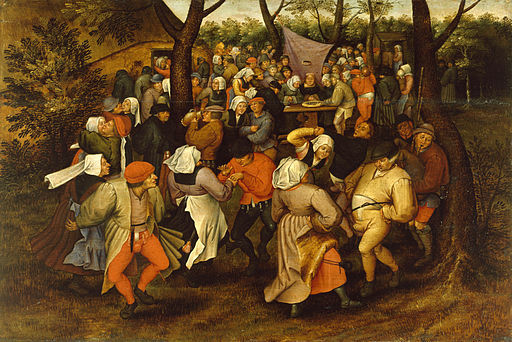 The painting Peasant Wedding Dance by Pieter Bruegel the Younger (1607). When February birds do mate, you either wed or dread your fate. The new bride must enter her home by the main door, and must not trip or fall. This is the origin of the custom of carrying the bride over the threshold. 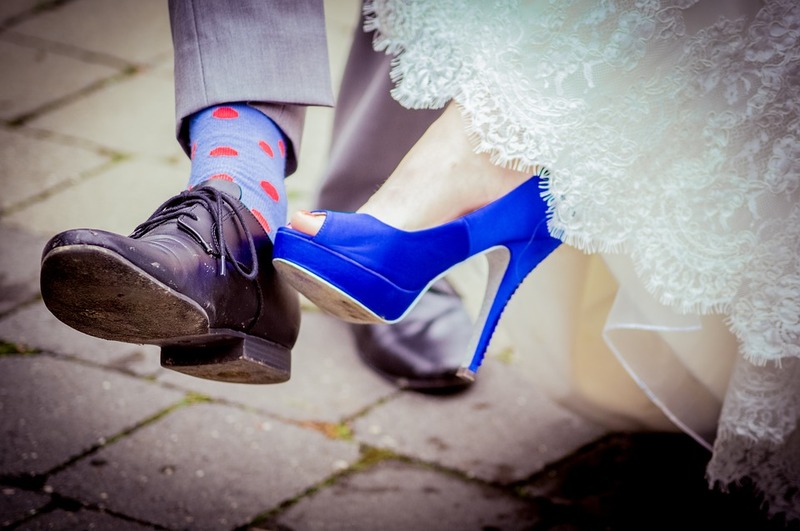 In a modern move, many brides are choosing to make their something blue be their shoes. 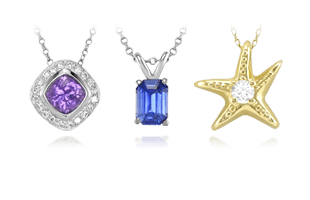 “Something Old, Something New, Something Borrowed, Something Blue, and a Silver Sixpence in Her Shoe.” This good luck saying dates back to the Victorian period. 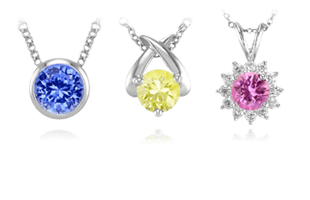 Many brides choose to wear a piece of jewelry from the family for the “something old.” The wedding gown is often chosen as the new item. The borrowed object is worn to remind the bride that she will have help in the future if she needs it. 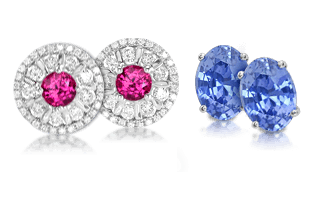 Blue is the symbol of loyalty and chastity. 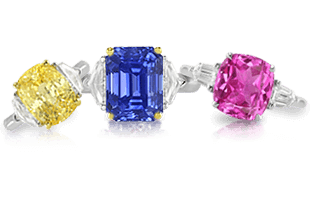 The “something blue” is frequently the garter. Throwing the bride’s garter began in France where pieces of the bridal attire were once considered lucky. The bride would throw the garter to the wedding guests and whomever caught it would receive good luck. In the United States, the groom traditionally removes the garter from the bride and throws it to the unmarried men. The man who catches it is thought to be the next to marry. At some weddings, the man who catches the garter will place it on the leg of the lady who caught the bride’s bouquet or they may start the next dance. It is also customary for the recipients of the bouquet and garter to have a photograph taken with the bride and groom. 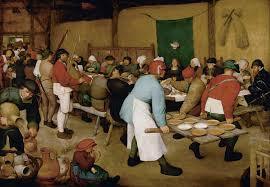 The painting “The Peasant Wedding” by Pieter Bruegel the Elder, circa 1567. In Italy, the groom is required to carry a piece of iron in his pocket to keep the evil eye (mal’ochino) away from himself and his bride. The iron is supposed to banish evil spirits. It is important that the couple repeat their vows when the minute hand on the clock is going upwards. This ensures they will work together in their married life. It is bad luck to say your vows when the minute hand is moving downward. A bride may wear pears to ensure that she will not cry on her wedding day. The flower girl strews flower petals to ensure the couple is blessed with children. The wedding veil hides the bride from evil spirits. The veil should never be put on before the wedding morning except during fittings, and then it must be tried on separately, not with the dress. When the bride is dressing for the ceremony, the veil should not be donned until she is otherwise completely ready, nor should she see herself in it until she takes her last look in the mirror just before starting for the church. It is thought unlucky for the bride to make her own wedding dress. It is also unlucky for the groom to see the bride in her wedding dress before until she arrives at the ceremony. The bride should not wear her entire outfit before the wedding day. Some brides leave a final stitch on the dress undone until it is time to leave for the ceremony. In the past, the prospective groom sent his friends or members of his family to represent his interests to the prospective bride and her family. If they encountered a blind man, a monk, or a pregnant woman along the way, the marriage was thought to be doomed. On the other hand, goats, pigeons, and wolves were considered good omens, bringing good fortune to the marriage. 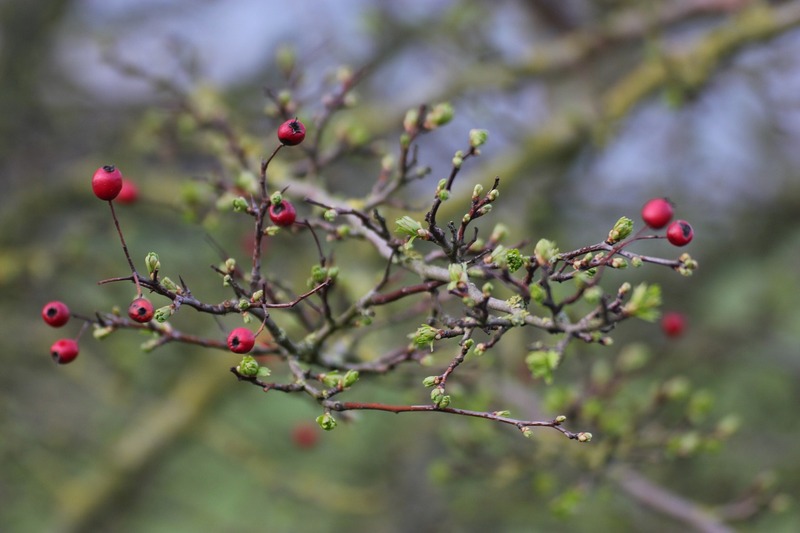 A hawthorn branch with red berries would act as a proposal and acceptance. During the Middle Ages in England, a man proposed by leaving a hawthorn branch at the door of his beloved on the first of May. If the woman left the branch at the door, it was a sign that she accepted the proposal. However, if she replaced the hawthorn branch with a cauliflower, it meant she refused his offer. It is unlucky to remove the wedding ring once it has been put on in church. If it falls off or is accidentally removed, then the husband must place it back on the bride’s finger. 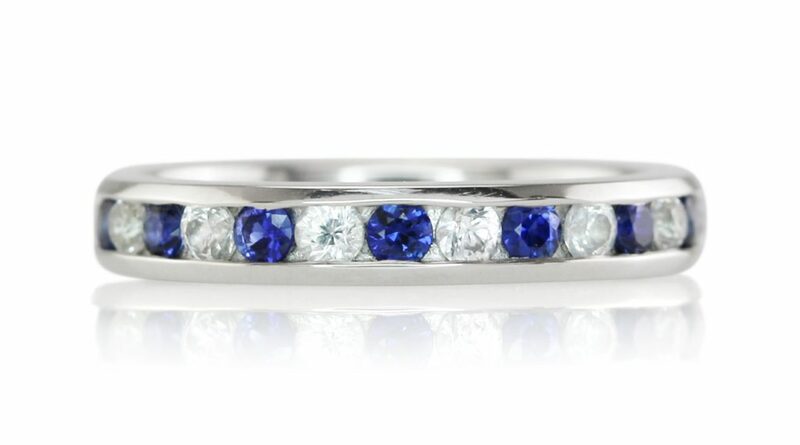 If the wedding ring is dropped before or during the ceremony, it is considered a bad omen. 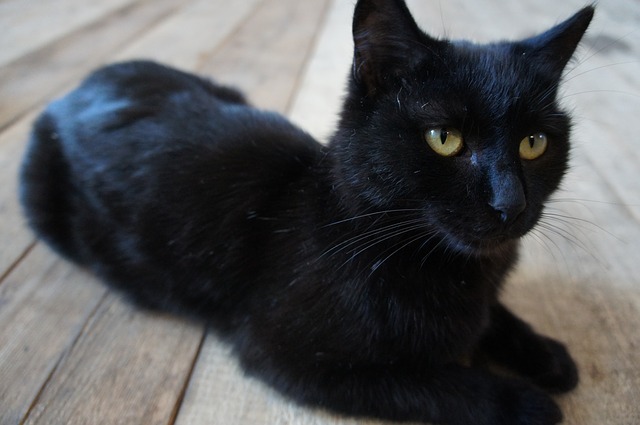 Although contrary to expectations, a black cat seen on one’s wedding day is considered lucky. Seeing a chimney sweep on the way to a wedding brings good luck. In some countries, it is possible to hire one to attend the wedding. Other good luck omens when seen on the way to the ceremony include: lambs, toads, spiders, black cats, and rainbows. Bad omens include: an open grave, pigs, lizards, monks, and nuns. In some cultures, inclement weather on the wedding day is considered a bad omen; but in other cultures, it is a good omen. Cloudy skies and wind are believed to cause stormy marriages. Snow on the other hand is associated with fertility and wealth. In India, members of the Bonthuk caste would add a bound pig to the orchestra playing at a wedding. It was thought that the pig’s squeals helped frighten away evil spirits, assuring a good marriage. 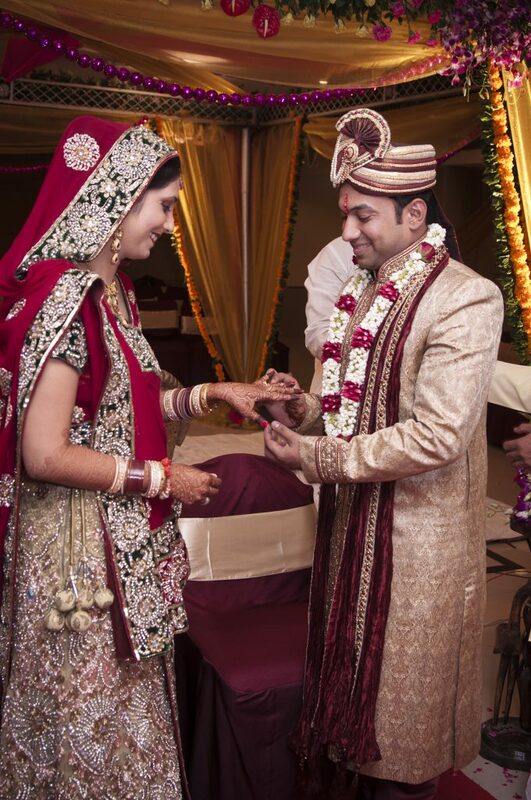 A traditional ring ceremony at a Hindu wedding. 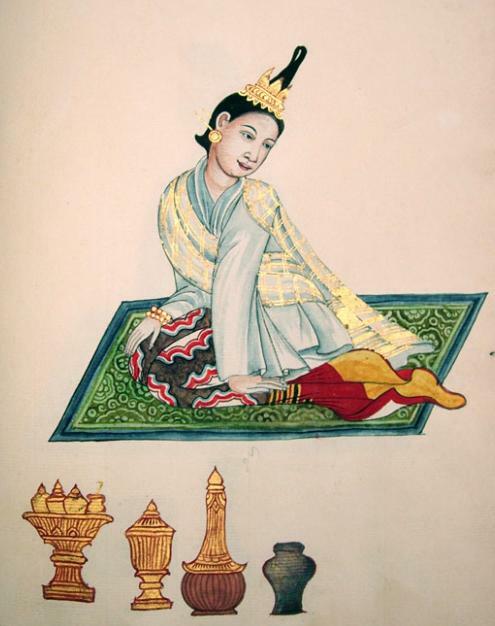 Painting of The Wife of a Burmese King’s Merchant. In Korea, ducks–which are believed to mate for life–are included in the wedding. 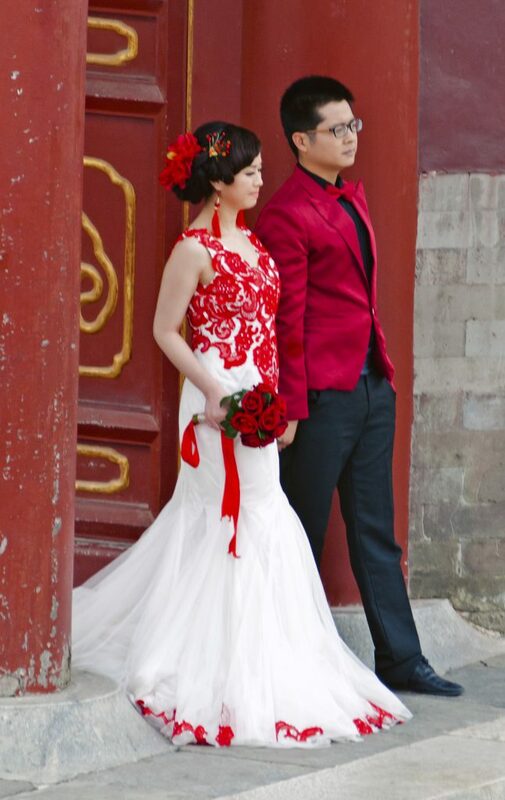 A modern take on the custom of incorporating red in Chinese weddings for luck. In China, red is a very lucky color for weddings, and a red umbrella is often used to protect the bride from evil spirits as she progresses up the aisle. Red is also used for much of the decorations, attire and many other aspects of the ceremony. In the Philippines, a number of superstitions and traditions hold sway. Two daughters from the same family must not marry in the same year. It is good luck to give a chamber pot for a wedding gift. The betrothed couple must not travel far to their wedding. The groom must arrive first at the church. The bride should step on the groom’s foot during the wedding if she wants him to follow her wishes during the marriage. In the Middle East, decorative dyes called henna are applied to the hands and feet of the bride to ward off evil. At the wedding, guests are given five almonds to thank them for wishing for five things: health, happiness, fertility, wealth, and long life for the happy couple. In Egypt, the bride is pinched for good luck on her wedding day. In Iran, the night before the wedding, three or four unmarried girls hold a clean white cloth over the heads of the bride and groom. One of the unmarried girls will grind two sugar cubes together as she asks God to bless the married couple. The woman whose name rubs off by the end of the night is said to be the next to marry in a Turkish and Greek custom. In Turkey, when a girl gets married, all her female friends write their names inside her shoes. After the wedding ceremony, if someone’s name has been rubbed off and can not be read anymore, it means this person will be married next. The impact of tradition also plays a strong part throughout the next section, which discusses Where to Wear Love Rings | Traditions and Current Trends.